What a first day that was! The afternoon was awash with rain and surprises. One of the biggest surprises happened when I left the bleedin tent, dammit! Dreadlockalien ushered the recycling crew onstage to get a round of appreciation for their efforts, but twas all a rouse! It was an excuse for Dawn from the team to propose publicly to her boyfriend Matthew. Congrats guys! I wouldn’t have the stones to propose publicly at the biggest festival in the world, but hats off! 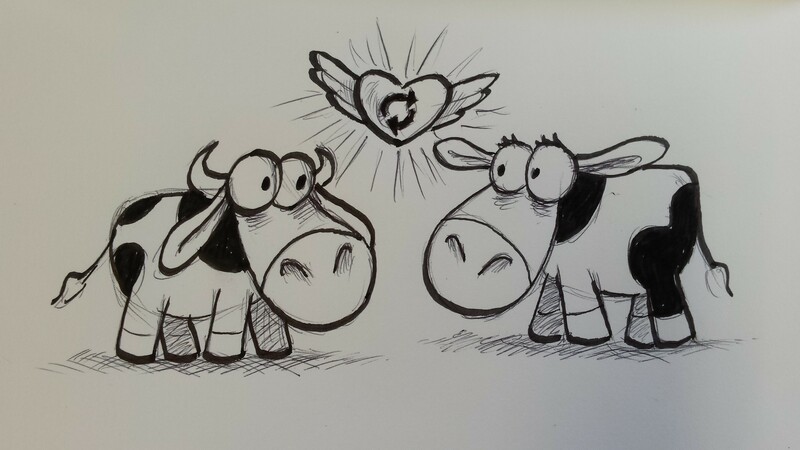 Quick sketch of the event I didn’t get to see (if the participants were cows). The afternoon’s poetry was absolute top drawer. Harry Baker had the audience eating out of his hand with his joyous food-based pun poetry and his winning world champ poem – technically the best poem in the world! MC Gramski is a freestyling genius. My jaw was on the floor with the spontaneous audience-suggested ideas rap he rattled off. I am in awe of anyone that can do that, but especially to have it make sense and have an emotional core – that is something else! Dan Simpson and Erin Bolens whipped the crowd into a warm fuzzy frenzy. This was Erin’s first booked gig since winning the Slam last year, and she nailed it. Dan was quickfire like a caffeine-induced hummingbird. I did my bit, including my winning Anti-slam poem (technically the worst poem in Britain). 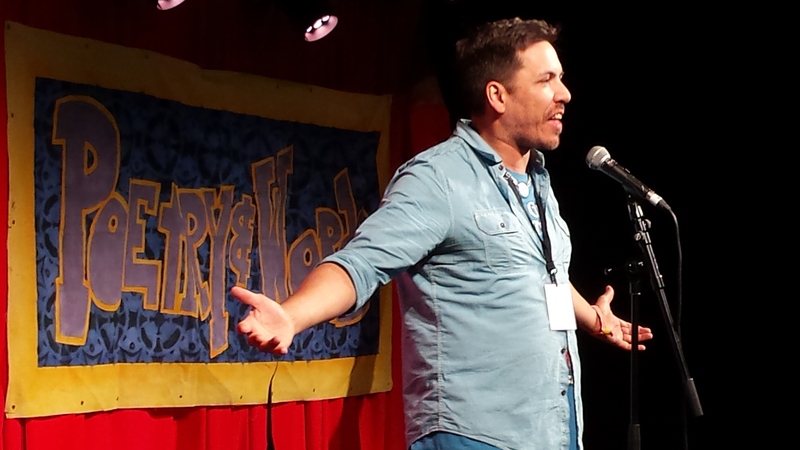 Then Joaquin, our Friday Headliner (all the way from Texas) took to the stage and launched into a high energy emotional full-speed Rollercoaster of a set. A fitting end to a quality day. is one of the reasons I always come back. equals a change in perspective. When the wheel is turning too fast just take a moment, sit back. This journey into light is a wonderful ride. smiles and cheers frkm all she meets. Finishing her ride, the lady got off the saddle. Open me up, bottle me down. Contributions from (in line order): Anon, Paul M, Oliver Cryer, Gary Wallace, Mark & Gemma, Franca Westaway, Polly, Sam Marns, Kirsty-Ann & Pat, Hazel, Tristan White and Jonathan Sardari-Kermani. 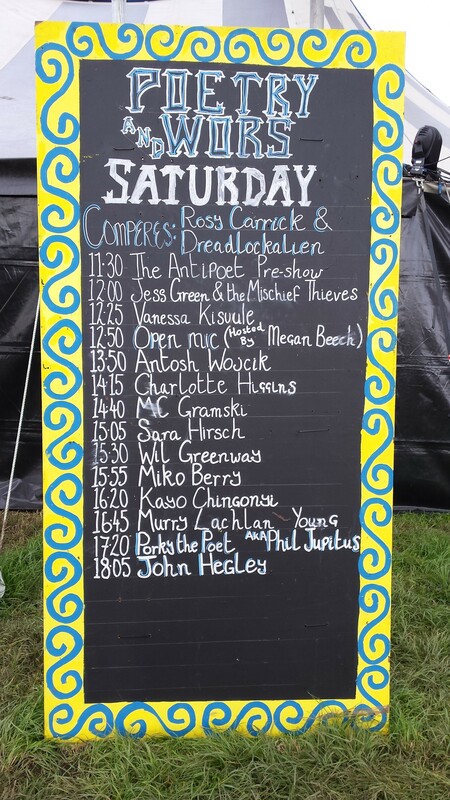 This entry was posted in 2015 Line Up, Glastonbury Poetry 2015, Uncategorized. Bookmark the permalink.